Covering 4343 sq km and at twice the size of Luxembourg, Peninsular Malaysia’s greatest national park sprawls in a huge, verdant swathe across the states of Pahang, Kelantan and Terengganu. Everything about Taman Negara is big: the trees are dwarfing, the forest impenetrably huge, the timescale dauntingly massive (the jungle is 130 million years old) and ants and fellow creepy crawlies are simply outsize. 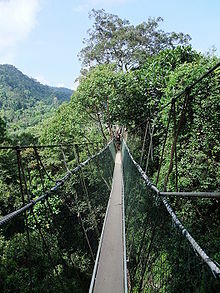 Most visitors penetrate Taman Negara in Pahang. It is billed, perhaps wrongly, as a wildlife park. Certainly this magnificent, lush region is a haven for endangered species such as the Asian elephant (Elephas maximus), tigers, leopards and rhinos, but numbers are low and sightings are rare. It’s unlikely that you will see anything more exotic than snakes (dog-toothed cat snakes, reticulated pythons, temple pit vipers and red-headed kraits all live here), lizards, monkeys, small deer, and perhaps tapir. Birdlife is prolific, however, and you will probably glimpse more insects – many at extremely close quarters – than you’ve ever seen in your life. 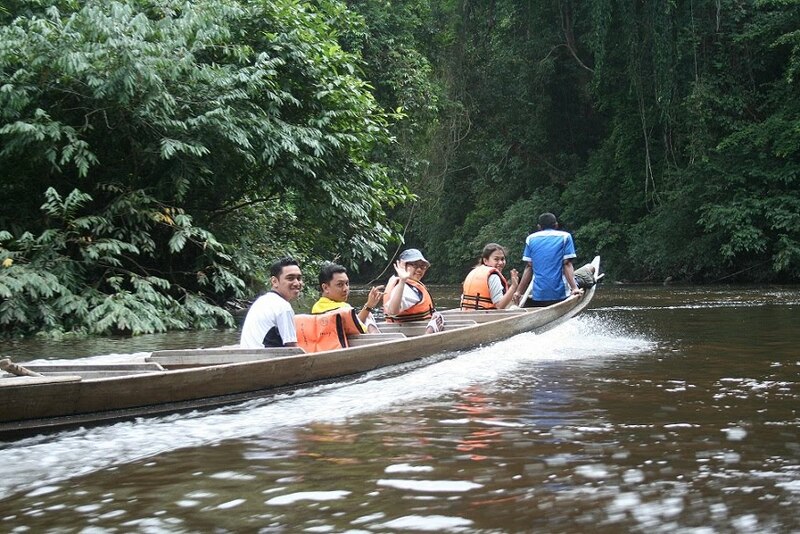 The park is also home to the nomadic Batek people, one of Malaysia’s aboriginal groups. The diverse flora is equally enthralling, ranging from luminescent fungi to rafflesia (a parasitic plant devoid of stems, roots or leaves and the world’s largest flower), orchids, two-tone ferns and towering, ancient trees with trunks that flare imposingly into the ground. The jungle at Taman Negara is so dense that you could pass within metres of an animal and never know it. The probability of spotting wildlife increases the further you trek from the heavily trafficked park headquarters, but sightings are never guaranteed. Some travellers are subsequently disappointed, but that is perhaps to miss the point: the greatest reward of a visit to Taman Negara is to be present in one of the world’s most pristine extant primary rainforests. The jungle here is claimed to be the oldest in the world: none of the Ice Ages had any effect here, and Taman Negara has eluded volcanic activity and other geological upheavals. More than any other destination in Malaysia, the more you put into a visit to Taman Negara, the more you’ll get out of it. Fleeting visits are naturally feasible, but invariably only scratch the surface. Consider an overnight trek or at least a long boat trip up one of the park’s rivers. If you aren’t comfortable doing these things on your own, don’t hesitate to join one of the tours that can be arranged at guesthouses and restaurants in Kampung Kuala Tahan. If you plan on making some longer treks, consider bringing food and proper equipment with you. The best time to visit the park is during the dry season from February to September. Rainfall is not constant during the rainy season, but when it rains it pours, and trails rapidly transform into treacherous, muddy bogs. The peak tourist season is from April to August. 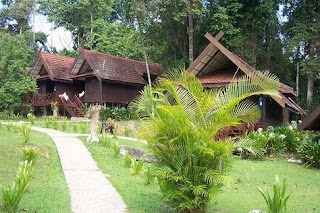 The park headquarters and the privately run Mutiara Taman Negara resort are at Kuala Tahan, across the river from Kampung Kuala Tahan. The Tourist Information Counter (8am-10pm Sun-Thu, 8am-noon & 3-10pm Fri), in the building behind the reception of Mutiara Taman Negara resort, is where you must register before heading off into the park, or to other park accommodation outside the Mutiara Taman Negara resort. 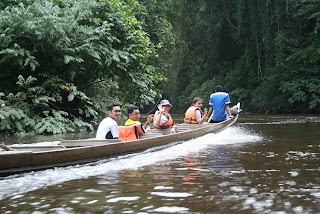 Come here also for information regarding travel within Taman Negara. Tour guides can be booked here. Camping, hiking and fishing gear can be hired at the Mutiara Taman Negara resort shop or at the jetty on the Kampung Kuala Tahan side. See Planning, p288, for recommendations about useful books. Daily video shows (9.30am, 3pm & 8.45pm) on Taman Negara are shown in the exhibition hall at the Mutiara Taman Negara resort/park headquarters. The exhibition hall itself has informative displays on the park. Other activities include jungle trekking (RM35, 9.30am), a night jungle walk (RM30, 8.45pm), cave exploration (RM45, 10am and 3pm), river rafting (RM65, 10am), rapids-shooting on Sungai Tembeling (RM40, 10am), a picnic trip to Lata Berkoh rapids (per boat RM160, 9.30am and 2.30pm) and visits to an Orang Asli settlement (RM50, 5pm). Internet ‘café’ (per 10min RM1; 8am-midnight) No coffee; just down from the Teresek View Motel. Police station (266 6721) Next to the Teresek View Motel. The park is very natural. It is very good for those who want to explore the animals and plants in the park.